Nothing else in Appalachian culture has enjoyed a double identity as intriguing as bootleg liquor: publicly venerated as a tradition and condemned by authorities. But two men are trying to redefine that reputation with a new (legal) distillery in Lenoir—the second in the state. Though their business and potent product are yet to be named, Keith Nordan, co-owner of the Wine Cellar & Bistro, and Chris Hollyfield are resurrecting mountain- made brandy. The process begins with crushed Wilkes County apples, fermented for two weeks, and then distilled. 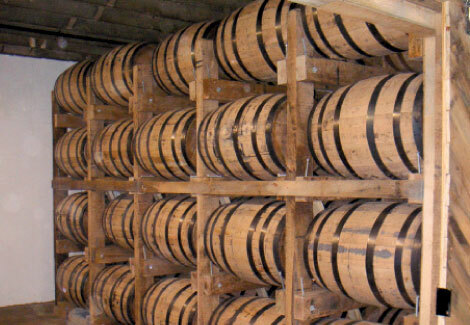 The brandy is aged in charred, white oak barrels for up to a year. Every batch is hand-bottled and single-barrel proofed, so “each barrel will stay true to the original character of the brandy, but have a slightly different proof and flavor from the wood,” Hollyfield says. “We do that to keep it as traditional as possible.” The distillery will also make strawberry, cherry, and peach brandies seasonally. Look for the brandy (retailing for about $20) in ABC stores by Thanksgiving.